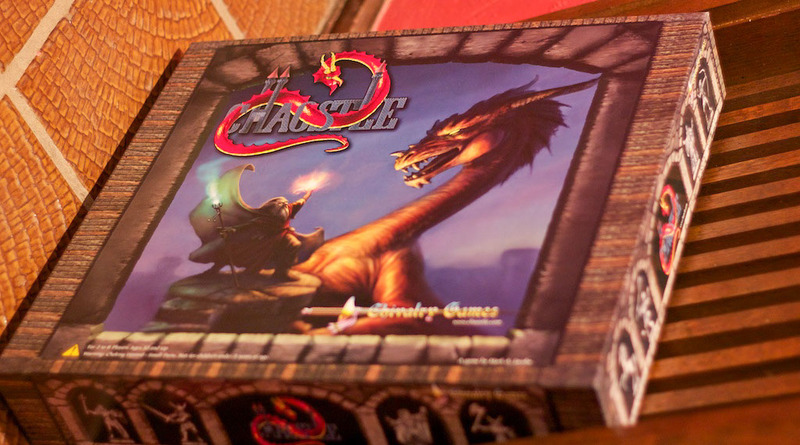 Note (Nov. 12, 2012): A better formatted review of Chaostle can be found here. Chaostle‘s conceit is simple: get to the center of castle. Everyone has this as their goal. The execution, of course, is where things get a little…shall we say, chaosy? 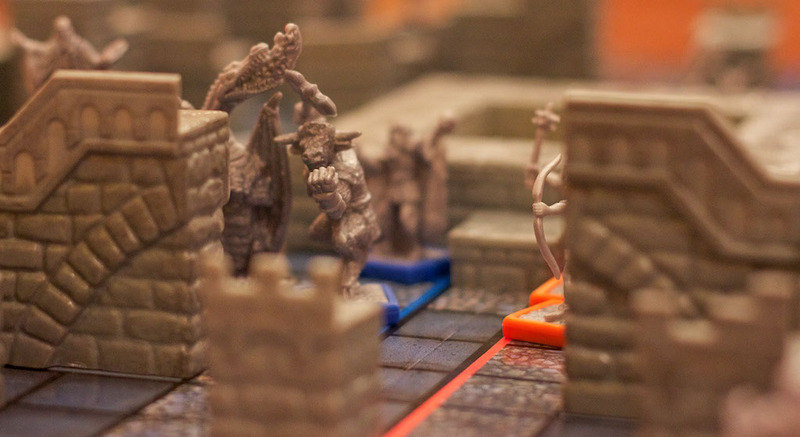 Chaostle supports up to eight players, so gird yourself. There are sixteen characters from which to choose, and if you have the maximum amount of players, each person gets two characters to move about the board. In the games that I have played, we have had a maximum of five players, and in that case you control three at a time. One of the first things you might notice about the game is the existence of physical castle walls. These are not just for show, and act as additional short-cut paths to get to the center goal. Each player starts on a colored square that they choose (which also gives their characters same colored booties for easy recognition), and from there they are taxed with getting around the entire board back nearly to this starting position. 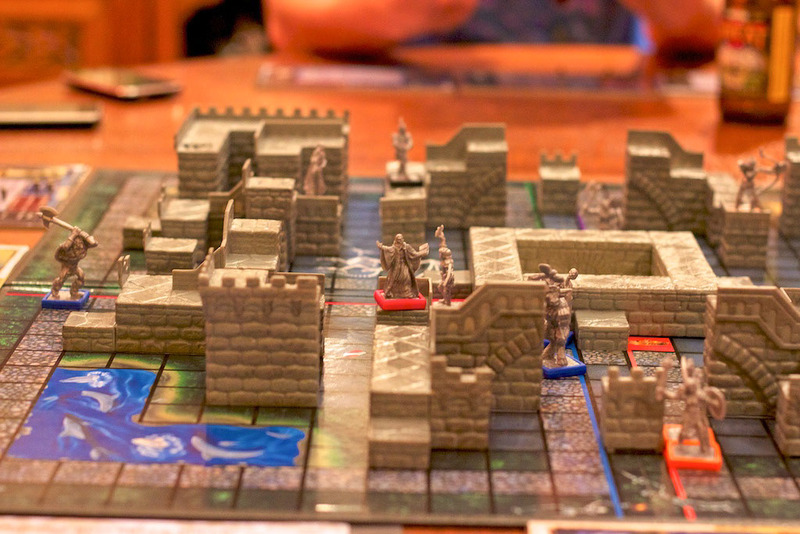 The aforementioned walls allow players to make this a potentially much shorter trip, provided they roll well. 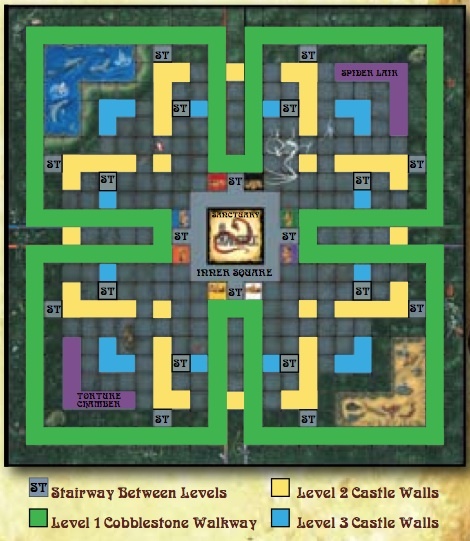 There are three “levels” of paths: the ground level takes the longest but has no interruptions besides other players, the second is a somewhat shorter path but has a few gaps, and the third is very quick but has great gaps to traverse. If a player gets to a step, they can go up to the second or third levels, but they are then subject to specific rolls. For example, if a player is on the second level path, he may find that he has to jump a gap of one space to proceed. That player has to roll a two or greater to jump across. The third path proves more difficult, and generally has gaps that require a roll of four exactly to proceed. As you might guess, taking these different paths are where the strategery comes in; while you might in theory be able to outrun the competition to the center of the board, if you don’t have the rolls in you, it’ll take you longer than the person who stayed on the ground floor. Speaking of rolls, Chaostle has a pretty great mechanic that adds an additional randomness to each turn. For each number on the dice, a different outcome is forced on the player. Rolling a one or a two allows you the ability to get out another character to play so long as no one is standing on your home color space. A three lets the player take another turn. A four gives the player the option to move or not; all other rolls force a player to move, even if that means backtracking. A five brings up The Fates, and a six is just a six, way to go for rolling it. “The Fates?” you ask. Oh yes. The biggest game changing mechanic of Chaostle comes from players rolling a five. Immediately after moving the five spaces, the player rolls once more and consults either the Card of Happiness or the Card of Doom. A one through three on this roll gets you a good thing, and a four through six a bad thing. From here, the player rolls two more dice, adds the numbers and finally receives their fate as listed on the card (and supplemental instructions). Some might be good, like getting full health or gaining the ability to roll two dice instead of one for a while for movement. Others might be bad, like being sent to a snake pit or, you know, just having that character die. Rolling a five can at times be extremely frustrating, but it adds enough randomness and craziness that makes its addition worth it. You can go from being on the ropes with all of your characters nearly dead, to having full health and ready to rock with one roll. Now let’s talk about the fighting because this is a fantasy game and THINGS NEED TO FIGHT. On your character card there is all manner of RPGy, D&Dy goodness, replete with hit points, weapon damage and range, and defenses. There is also a super rad picture of your character that came via time machine from the ’80s. Fighting is generally initiated by the current player towards another simply by manner of speaking it. “I want to burninate the countryside of your face with my dragon,” is something you might say provided you have a dragon and you hate the uncharred face of your opponent. 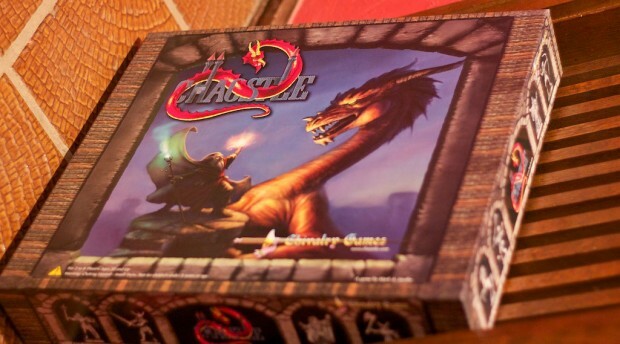 Fighting goes back to the tried and true methods of dice rolling, and like other facets of the Chaostle Dice Rolling Experience™, each number corresponds to something. Here, they correspond to weapons and skills, and each character has six (convenient!). For example, if I attempt with my unicorn to fight, say, skeleton archer (we will call him Skellybones), I would announce my intention to pile drive my mega horn into his decrepit ribcage, roll, and hope that whatever attack randomly comes up lands true. Each attack also has a range, so some of them may not hit (protip: unicorn horns don’t have much range). Your opponent gets a chance to retaliate if they can, and fighting goes back and forth until the attacker backs down or misses or someone dies. If someone does die, they are taken from the board. Fortunately, they are not super duper dead, and with a roll of one or two on a successive turn can bring them right back out, Sorry!-style. 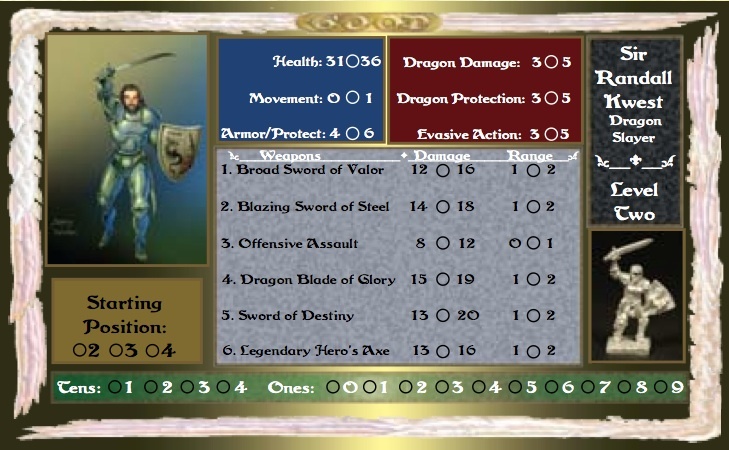 The winner of the melee receives one upgrade to a stat on their character card. 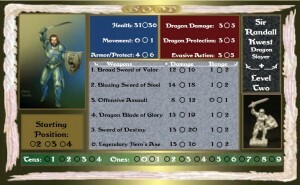 If you check out the character card shown to the left, you might, for example, upgrade Sir Randall’s health to 36 from 31 after a successful death dealing. And that’s the long and short of the game. Take shortcuts, fight around the board, and hope you get to the center first. 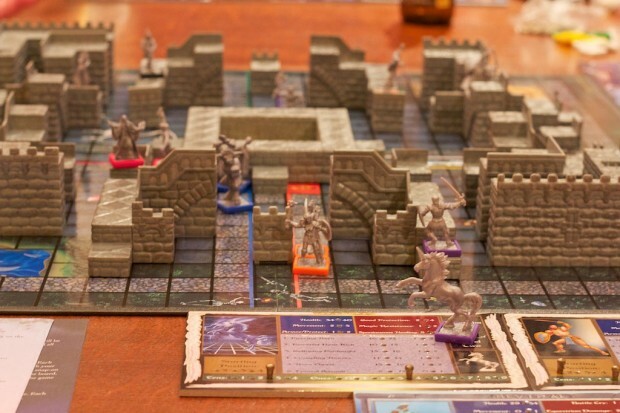 There is an added roadblock at the end in that you have to fight the castle itself to break into its gooey center, but otherwise, once you get passed all the dice rolling rules, the game is pretty straight forward. And now the money question: is it fun? The answer is “Yes,” but I will throw in the addition statement of “…so long as you have the time.” It’s not a short game, although it’s not the longest I have ever played. The last game I was involved with took all of three and a half to four hours to complete, and it would have actually gone on longer had The Fates not intervened and aided one of the players to victory. And that brings me to my second and last beef: while the fates are fun, there is one in particular that can somewhat ruin the game. With a super lucky dice roll, a player can simply win. A magic portal opens and they go straight to the center of the game. While unlikely, the first roll of the game could be the last. Otherwise, the experience is a positive one due to the interesting game mechanics, multiple paths, and multiple characters. Recommended. You can grab Chaostle for $56 at the moment from Amazon . 2-8 players. Ninja Edit: I was contacted by the creator of Chaostle regarding the two complaints I have experienced while playing the game, and it turns out that there are amended Fates that not only fix that one “WIN RIGHT NOW” fate but also speed up the game by allowing characters to more easily get out of traps, among other things. 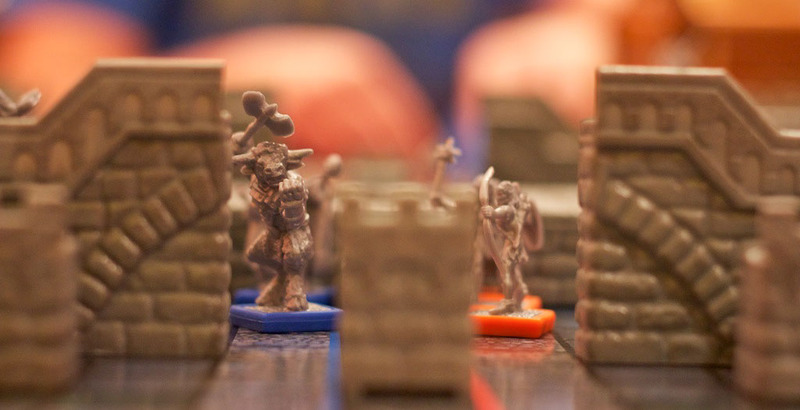 All new copies of the game should have the revised rules, so now you have no excuse! If you happen to have the game, you can find and download the new stuff from their resources page. You can also find Chaostle on Twitter.